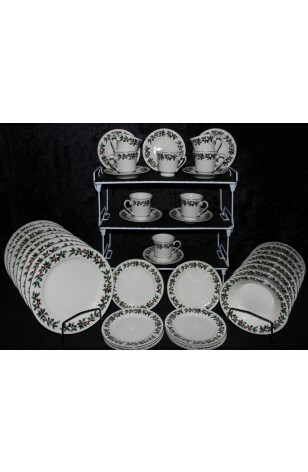 Baum Brothers China Christmas Holly Formalities Dinner Service - Circa 2000 - Totaling (40) Pieces, as a Service for (8) Eight. A Beautiful Christmas China Dinnerware Set by Baum Brother China, in their "Holly" Formalities Pattern. It has a Cream Background, with Wreath of Holly and Red Berries on the Lip of the Plates and Outer Rims of the Cups. Cups and Plate Rims are also Trimmed in 22kt Gold. Great Holiday Dinnerware set having a full service for (8) Eight, for your family and/or friends to enjoy a memorable Christmas Dinner together. 8 - Bread, Dessert Plates - 6 1/2"